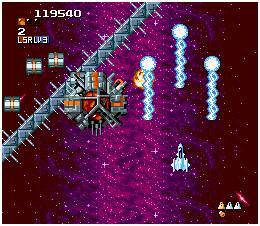 Space Megaforce is a vertically scrolling shoot-em-up that was released as Super Aleste in Europe and Japan. Mechanical spheres have fallen from space and it's your job to stop them attacking cities around the world. Eight weapons are available (such as Lasers and Missiles) and each can be powered up by collecting chips; your health is dependent on the latter, as while taking damage at the maximum Level 6 will only decrease your power, getting hit at Level 0 results in a lost life. The game is a visual beast and some of the effects are astonishing, such as Stage 2's Mode-7 graphics where enemy bases scale and rotate into view from the distance; equally remarkable is Stage 5 with its distorted backgrounds and large amount of destructible scenery. Throughout, there's zero discernible slowdown which is mighty impressive given the ridiculous amount of sprites, bullets and environmental debris littering the screen at all times. Perhaps the main highlight are the huge bosses that can sometimes take up almost the whole screen and each is complimented with clever attack and vulnerability patterns. The range of weapons on offer is vast and I love how you can collect chips to power-up further, as it creates an interesting risk-reward element where you sometimes have to put yourself in harms way. However, when you reach the latter stages it's easy to start having a love/hate relationship with the weapons, as it's not uncommon to accidentally obtain a less powerful one due to icons appearing on screen for lengthy periods of time in crowded spaces. Also, while the stages are usually quite lengthy, a handful are over in a heartbeat and they almost finish in an anti-climactic manner without any sign of a boss battle. Space Megaforce is a technical marvel and its intense gameplay, interesting level design and unique power-up system make for one of the most satisfying shoot-em-ups on the console. It does have a few shortcomings (the main irritation being the cluttered weapon icons), but overall they don't detract from an otherwise top-notch experience. Random trivia: The Japanese version of Super Aleste has a number of differences including a more fleshed out plot and ending.